Good evening everyone and welcome. I’m a recovering stammerer, I used to be unable to stand up and say more than four words but I’ve rather more for you than that this evening, so please bear with my weird and wonderful speech techniques ! I hope my talk will raise quite a few questions but please do save them up as you may well find the answers come before the end. I’m going to talk quite a bit about the astrology in Christianity tonight but it’s NOT designed to send you rushing back to church. Instead maybe it will help to interpret charts with a new understanding. I hope you’ll never see the planets in quite the same way again. I want to make just two points to begin. I hope I will give you good reasons for what I am proposing and secondly I want to assure you my ideas will give some valuable support to most, if not all beliefs, especially if you put your faith in the stars. In previous talks I have been able to assure both Christians and humanists my ideas support their beliefs and I think that is probably a first ! Even more important, I believe these ideas are invaluable in showing a common logical origin for all religions, a common astrological origin for all religions, showing we all recognise and worship different visions of the same One God or Universal Spirit, focussed in the Spirit of the Sun. As our shrinking world seems increasingly beset by interfaith confrontations, that seems a priceless goal. My subject is the Tree of Life…. Many of you may be familiar with the Tree of Life but for those of you who aren’t, this is the central figure of the Kabbalah, the esoteric, secret Tradition of Judaic wisdom which lies behind most of the Bible. Kabbalah simply means Tradition. I will be trying to demonstrate the Tree of Life is really all based on astrology. This illustration seems to make it quite clear. Incidentally, I have placed the planets on the Tree in their ruling Signs because this makes their true Kabbalistic characters clearer. You may be surprised by one or two of these rulerships ! I would love to come back another time on that interesting subject, it might yield a productive discussion but it is a bit too big to begin tonight. So the Tree of Life confers immortality on those who eat its fruit. Let’s eat that fruit tonight and I will guarantee, everyone who is here will go home immortal and if you listen carefully, what’s more, you’ll believe it !! The Tree is clearly there at the very beginning of the Bible and very much in pride of place, the greatest treasure of Heaven, even to the very last chapter of Revelation which gives us a vision of the New Jerusalem. This is the City of God, a kind of symbolic picture of the Kingdom of Heaven on Earth, after the bloodbath of Armageddon. The City of God is recognised as a more civilised version of the Garden of Eden, fulfilling the expectation we should one day regain Paradise. This sounds a bit like Bible studies but some of you will have caught the astrology there which I’ll return to. Greece and Rome, Egypt and Babylon and the rest of the myths, were not the only ancient religions where the heavens were recognised in all their glory as the home of the Gods. Is the Tree of Life really astrological ?? Well, it’s got these eleven Sephiroth or Shining Ones which fit precisely the characters of the ten planets of the horoscope plus Earth -- in their ruling Signs. One of the most remarkable things about the Tree is that Traditionally three of these Shining Ones had no planet attached. But as Warren Kenton, the renowned astrologer and Kabbalist has said, the ‘new’ planets fit these places perfectly. If we think about it, we really have to deduce that the ancients knew these planets and their characters all the time. If they had time to meditate and really get to know the energies within… I think we all know even little Pluto doesn’t fail to make his presence felt ! Apparently Pluto was known by the Egyptians as Anubis and by the Greeks as Dis, translated by the Romans… as Pluto. Where else did they get Pluto from ? The twenty-two Paths of the Tree simply comprise the ten planets of the horoscope plus the twelve Signs. That’s pretty comprehensively astrological. The twenty-two Paths are the foundation for the twenty-two letters of the Hebrew alphabet and it is probably significant Revelation has 22 chapters. Many of you will know these Paths are also the basis of the 22 Major Arcana or Trumps of the Tarot, just as their four Suits represent the four elements and the ten number cards represent the 10 principal Sephiroth on the Tree. The Hebrew letter for the Moon’s long path is Gimel, a camel, the ship of the desert, full of water, while Pluto’s is a tooth or a needle. The strange image that ‘it is easier for a camel to pass through the eye of a needle than for a rich man to go to heaven’ is pure Kabbalah. The path of the camel does go up to the heavenly heights of the Crown through Pluto, through the eye of a needle. Turning back to the Tree itself : can we doubt that when Revelation describes the Tree of Life having twelve manner of fruit and yielding her fruit every month, it is describing the cycle of the Moon through the zodiac ? that it is confirming the astrological nature of the Tree as an archetypal horoscope ? Kabbalists find endless wisdom and significance with the Tree of Life, just as we can in the horoscope, which we might call the Circle of Life. I want to pass very briefly over other important astrological aspects. All religious festivals, Jewish, Islamic, Hindu and Buddhist, are based on the lunar calendar, just as Easter and Christmas are astrologically fixed. The Magi at the birth of Christ were astrologers as many Bibles now acknowledge and their presents of gold, frankincense and myrrh make it clear they were reading Christ’s future life. We mentioned earlier the City of God, the New Jerusalem, at the end of Revelation, is built exclusively by the zodiac rule of twelve with four sides with three gates each, representing the twelve Tribes of Israel and the Twelve Apostles. Each gate is adorned with a precious stone : “the twelfth : an amethyst” is still recognised as the twelfth, Pisces stone because in ancient times it was used to protect against the excesses of drinking, the Pisces vice. Revelation also gives us the image of the throne of God attended by the four mythical creatures first portrayed in Ezekiel : the lion, the bull, the eagle and the man. These are accepted as representing the four fixed Signs, Leo, Taurus, Scorpio and Aquarius, representing the four elements and are associated with the four Gospels. So we find astrology at Christianity’s most sacred heart, the throne of God. Virtually all ancient religions had at least some obvious astrological gods, at least the Sun and the Moon. 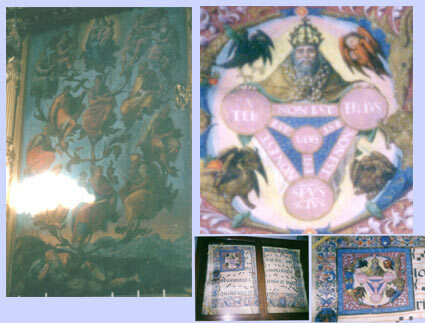 Plato unmistakeably described the planets as divine spirits and honoured the traditional astrological pantheon of gods. I think we can understand easily enough why this hasn’t been openly acknowledged in our current faiths. Astrology was extremely fashionable in the ancient world with women wearing Sun and Moon pendants and orgies in the sacred groves of Ashteroth, Venus. There were no doubt many ‘poorly trained’ charlatan astrologers who gave the sacred science a bad name, so that the planet gods were brought into disrepute. It was essential to recognise a God whose majesty and omnipotence was not sullied by this mundane familiarity. To re-establish the mystery, wonder and awe of God. Let’s return briefly to the verse which first introduces the Tree of Life in Genesis, insisting it bestows immortality and see if we can send everyone home glowing with their new god-like status as Immortals. Quite simply when you recognise the science of the spirits and the spiritual dimension it reveals, you should recognise the Spirit within. If we can recognise we have a Spirit within and live in a world of spirits, we should know immediately we don’t die when the body dies. Spirits are immortal and do not die but are reborn again and again. The Kabbalah recognises reincarnation and all ancient religions recognised reincarnation, though again that is a subject for another occasion. Remarkably consistent, near death experiences assure us it’s a wonderful surprise, the experience of a lifetime but astrologers shouldn’t be too surprised. So… there is plenty of history, empirical evidence, verified accounts, as well as the Tree of Life’s metaphysical guarantee so I hope we’ve cleared up the small matter of our immortality ! I’ve taken a good deal of time to prepare the ground for the really challenging part of my talk by establishing first and foremost the astrological character of the Tree of Life. This is set in a general context of the widest, deepest and strongest astrological culture in ancient times and specifically the astrological festivals in both Judaism and Christianity as well as clear astrological imagery at the heart of both faiths, especially in the last book of the Bible, the prophecy of Revelation, which should be seen as looking forward to the new star-studded age of Aquarius, dawning about now ! One of the main purposes of my book Heaven on Earth is to demonstrate all our current world faiths are astrological and the gods they recognise in their various pantheons are really sophisticated representations of the planet gods of ancient times. I believe the illustrations and simple texts just about have the case sewn up. Especially the Tree of Life. What other kind of Gods is that going to produce ? Non-astrological Gods ? It makes simple sense of something which has become inexplicable and incredible to many people and we’ve seen there’s plenty of evidence for astrology at the very heart of Christianity and the Tree of Life sums it all up par excellence. This conventional version of the Tree of Life has many of the principal OT figures attributed to various Sephiroth or Shining Ones on the Tree. Abraham, the wealthy, expansive traveller and Father of the Jewish nation, is attributed to Sagittarian Jupiter who was the Father of the Gods in many ancient faiths. Isaac whose story is one of being reborn from the jaws of death is associated with the Scorpio side of Mars, Mercury is associated with Aaron, the priest and spokesman for his brother Moses who apparently also had a //stammer, while dubious Eve and murderous Cain are associated with Saturn and Capricorn. This is a particularly complex attribution which we will return to. David the lowly shepherd boy who became king represents the Earth while his somewhat inconstant wife, Bathsheba, represents the Moon. Their son, Solomon’s very name is Kabbalistic and designates him as the archetypal Sun King. So some of the central stories of the Old Testament seem to have been written rather like the Greek and Roman myths, with characters which illustrate and embody the characters of the planets. One of my first impressions of the Tree of Life was that this must be the origin of the Christian Cross but only recently I learned Catholics often call the Cross ‘the Tree of Life.’ These are not practical dimensions for a cross but the Cross essentially reflects astrology’s Grand Cross of the elements, earth.. air.. fire... and water… which crucify us all at some time in life. This next illustration is NOT so Traditional Kabbalah and relates to Christianity. It is my own idea but I think it makes pretty good sense. Hearing the experts speak about the Christian Trinity, it seems no one really knows where it comes from or really what it signifies, certainly in any clear objective way. At the same time we’ve got planets which have a divine power over our lives and have a massive tradition of divine, religious recognition. But do the portraits of the Christian Trinity fit any of the planets ? Well, yes, they do, very well indeed : as far as we have portraits of these figures, which is not always in great detail. The portrait of Jehovah is particularly lacking in details to relate to Jove, Jupiter but Christianity recognises him as the Father, just as we’ve already noticed, Jove, Jupiter, was recognised as the Father of the Gods in Greece and Rome. In Egypt and Babylon, as Ammon and Marduk, in India as Indra, among the Norse Gods as Thor, Jupiter was, like Jehovah, the pre-eminent deity. Jehovah certainly had the stormy, unpredictable character we associate with Jupiter and he is a war-god, the Lord of Hosts, very much like Thor with his thunderbolt. It seems that in the age of Aries, warrior qualities were the most important and though we might not think of these for Jupiter today, there is no doubting his power. Jehovah is repeatedly referred to as the Lord of Mercy and this is used particularly frequently in the Koran to describe Allah, the Muslim translation of Jehovah. Mercy is Jupiter’s seat on the Tree of Life. The favourite titles of Allah are actually the Merciful and the Compassionate which perfectly describe Jupiter’s Sagittarian and Piscean characters. Mercy is the prerogative of the Archer, or the judge, a typical Sagittarian occupation, the one who has a licence to kill or condemn, while caring and compassion define Pisces. We are on much clearer ground with the Holy Spirit as Uranus. We don’t have a terribly full portrait but what we do have is pretty clear : perhaps this is the nature of the planet. I don’t always find Jupiter terribly obvious in someone’s personality whereas Uranus often stands out as quite unmistakeable ! The Holy Spirit is a bird, the dove, and comes in rushing winds and ‘tongues, as of fire’ which inspired the apostles to speak eloquently, to ‘prophesy.’ This has always been the gift of the Holy Spirit so that when a preacher speaks eloquently, he will say he feels inspired by the Holy Spirit ! In the Bible the meaning of prophesying is not so much seeing the future as speaking the truth, speaking for God. I think we can all recognise the spirit of Uranus in this. He’s always the one who has great ideas and can speak eloquently… for ever but above all he seems to have a very strong sense of truth : if one denies a truth Uranus holds dear, that’s when you get the earthquakes ! The dove apparently symbolises the Aquarian element of air, as do the ‘rushing winds.’ Uranus was represented as Sophia, Wisdom, in the Old Testament, the name of his Sephira, as well as ‘God’s Spirit’ and ‘God’s Holy Spirit,’ and it’s been a pity to lose this feminine element in the Trinity. There’s volumes to say about Christ as Neptune but I want to keep it as short as possible because there’s much more I’d like to say than merely making these identifications which are pretty straightforward when you think about it. But equally, for many people, however much evidence I pile up, it won’t make much difference because it is finally quite personal, as well as being, well, quite a major cultural challenge ! Many people now want to find a new meaning in religion but equally, many don’t. Have you noticed how many Christian cars display the Fish symbol ? The Fish has been the symbol for Christ ever since the earliest days of persecution and C G Jung, the great spiritual psychologist (and secret astrologer) had no hesitation identifying Christ the Fish as the Messiah of the age of Pisces. The Gospels are awash with images of the sea, fish and stories involving fishing. Many of Christ’s disciples are fishermen who will become ‘fishers of men’ because all men were fish in the last, Christian age, the age of holiness.., mystery.. and twelfth house monasteries, nunneries.. and Christian charity. The Gospels are full of other Pisces imagery : Christ is the ‘true vine’ and the wine is still his special sacrament, his blood, his spirit. He is the sacrificial Lamb who suffers piteously and the passion of Christ is such a moving experience it is still celebrated with great feeling every Easter. But the Kabbalah is more than just astrology. Neptune’s throne is the Crown : the Gospels insist Christ was the King of the Jews and he wears the cruel crown of suffering which is such a pathetic Pisces image. The halo seems to represent this crown of holiness we associate with Neptune and the Twelfth House. 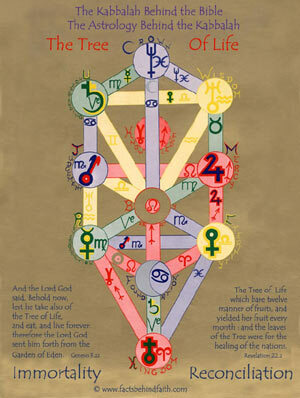 These illustrations from Spain show how far Christianity embraced the Kabbalah of the Tree of Life. Mary with Christ, rather vague! at the top of the Tree, is a politically necessary position rather than anything more meaningful but this second illustration from an illuminated manuscript actually shows a Kabbalistic arrangement for the Trinity : Pater, Filius, Spiritus Sanctus, Father, Son and Holy Spirit with another Sephira for God, Deus, in the centre, which seems to be remarkably close to what I have proposed. One of the most striking aspects of this recognition of the astrological Kabbalah behind the Trinity is that it explains the mystery of the ‘Three in One’ particularly successfully. The great alchemist and amateur theologian Sir Isaac Newton was baffled by it but when we recognise God is really the Universal Spirit behind all Creation, for us on Earth focussed in the Spirit of the Sun, we see there is really only One God, which unites all three Planet Gods of the Trinity, and all other Gods and explains the mystery. Just as the other planets of the horoscope are nothing without the Sun. The Spanish Kabbalah absolutely insists the Trinity doesn’t make God by itself : Non Est, Non Est, Is Not, Is Not but only through the God at the centre : Est, Est : Is, Is. Of course the Universal Spirit is not limited to the Sun but the Sun is its local representative which beams this Spirit into every heart. It’s important we recognise the divine spirits of all these planet gods are not quite the same as those we deal with in astrology. The horoscope is concerned with everyday matters but there is a higher side to all this : the same character, perhaps, but a higher, divine spirit, just as we have our everyday energies and then something beyond all that hidden within. Because I don’t want to be boiled in oil by the Capricorns, I will hastily say, I think those with the Sun in Capricorn are generally more enlightened about this spirit than most of us. I don’t think I’m very original in making this particular identification but … why Saturn ? The Saturn Trump in the Tarot is called ‘the World’ and usually shows a naked woman, an Eve figure : archetypal Capricorn Saturn, and the prime targets of the Church’s professed bias for the spiritual to the exclusion of any material ambitions or pleasures, though I heard a certain astrologer and Kabbalist say last week that ‘all Churches are only interested in money and power.’ We’ll see Christ says the same a bit stronger in the Gospels. But we all recognise evil in the world, certainly beyond the ‘lust of the Goat’ which William Blake says is the ‘bounty of God.’ It is surely not these material things themselves which can be good and essential but their exclusive pursuit which causes problems. If we totally devote our lives to money, ambition, power, as many people do, we are going to miss these higher spirits, we are going to sacrifice our feelings, our families, our relationships, our ideals and our faith in higher things, we are going to sacrifice our humanity and that is dangerous. That lack of humanity is my definition of evil. Many people don’t believe in anything non-physical, as astrologers know only too well. Astrology is the grandfather of all sciences but now modern material science dogmatically insists anything which can’t be measured by physical instruments can’t be real. Astrologers know the material world is only the earth spirit of our science and there are a few higher levels before we even get to the immortal spirit which religion is always talking about. Of course religion has the same problem with modern materialist thinking. Astrologically I believe this blind single-mindedness can only be explained by a ‘special relationship’ with Saturn because Capricorn is one of Earth’s ruling Signs. Physically we’re certainly a planet of many mountains, even under the sea, poking out everywhere to make islands but above all, metaphysically, psychologically, we’re all obsessed with material things, worldly status, while what really makes us happy gets short shrift. This would certainly explain why the terrible problem of evil is ascribed to Saturn. It might also explain the fabulous cornucopia of our amazingly beautiful world ! So that’s one half of the Saturn story. The other half is the Virgin Mary : even more interesting and important and much more wholesome ! The Virgin Mary represents the positive side of Capricorn Saturn, all the good things. Her ‘Virgin’ title immediately suggests the physical earth element, akin to Virgo, and she is officially recognised as the ‘new Eve,’ by the Church, Eve redeemed, which in Kabbalah immediately associates her with Saturn’s Sephira, Understanding. This extraordinary quote from Matthew’s Gospel (16.23) not only confirms the association of the Church with Saturn and Capricorn but also confirms the association of Saturn and Satan and again gives a strong idea of the extent of Kabbalah and astrological influence in the Gospels. As we’ve noticed, the number twelve in the Bible invariably refers to the sacred zodiac and when it’s twelve stars, accompanied by the Sun and the Moon, we should have no doubt ! Commentators have long linked these twelve stars to the twelve apostles and so to the twelve tribes and so the twelve gates of the very astrological New Jerusalem which seems to be the vision of God’s Kingdom in the new age ! In the age of Aquarius we should expect astrology to be much more prominent ! This portrait of Mary represents the Aquarian side of Saturn, especially appropriate to the new age and perhaps we should recognise Mary as one of the patron deities of astrology. Certainly as Queen of the Heavens, with the Sun, Moon and zodiac stars, she makes a pretty good symbol ! The announcement by the Pope in 1950 of the Assumption of Mary to Heaven means the Catholics now recognise a Quaternity rather than a Trinity but this Papal Bull also announced the Marriage of the Heavenly Bridegroom to the Heavenly Bride. I wouldn’t venture into these areas if CG Jung hadn’t done so already. According to the Pope, and Revelations, and specifically explained by Jung, we have a theological marriage between Christ and his Mother Mary. Perhaps this explains why Mary’s Virginity is so insisted upon. But this is only theology, essentially uniting troublesome earth to the higher elements : recognising the spiritual nature of the material world. Promising stuff : ‘and not before time’ we might say ! Jung explained that the Divine Child, the fruit of this union, mentioned in the Aquarian Mary prophecy, would be an Incarnation of the fifth, quintessential element, essentially an Incarnation of our immortal, divine Spirit within, an Incarnation of the Sun God. This Incarnation would be at once the Second Coming of the Messiah, an idea supported by both Buddhism and Hinduism but it also opens the door to any man or woman recognising their own divine spirit within, recognising their own divinity. Certainly every astrologer knows we are all incarnations of the Spirit Supreme : we all have the Sun’s Spirit within us. If we are to progress, perhaps if we are to survive, it is essential we get up off our knees and take responsibility for our world instead of blaming it all on God. I’ve shown how far astrology is behind not just the classic ancient religions but also behind the ancient religions of Christianity and Judaism. Finally I just want to take a moment to suggest the Tree of Life, the Kabbalah, is at the centre of a worldwide tradition. We can recognise significant similarities in the portraits of Egypt’s Resurrected Osiris and Christ which point to a common Tradition but it should be no surprise to find the same Kabbalah or Tradition in India. There have always been strong links between the two regions, from as early as 2000 BCE ! and Christianity arrived in India in the 1st century. I spent some years in India exploring these ideas so it was natural I should look at the Hindu deities. I instinctively felt if Christianity were based on planet gods, this would at least extend to India and in fact I had no difficulty recognising the eight principle Hindu deities as representing the eight major planets on the Tree. While Christianity just focuses on the outer giants, Hinduism represents Mercury, as Hanuman, Venus, as Skanda, with his peacock, and Mars as Rama. Unfortunately more detail than that will have to wait for another time ! Finally let’s look at the Chinese Taoist religion : it is amazingly simple ! The Tao is based on the eight oracular figures, the tri-grams of the I Ching which are still celebrated on the national flag of South Korea. I am still absolutely astonished to find how precisely these fit the astrological characters on the Tree. The eight tri-grams are traditionally arranged on a Compass Wheel which just transfers straight onto the Tree, as you can see in these diagrams. If I then show the astrological definitions of the Sephiroth alongside the traditional Taoist definitions, they are extraordinarily close. In a strange way, this rather confirms the zodiac definitions of the Sephiroth ! This close correlation also confirms what we should really expect. Astrology is the ultimate science, the ultimate knowledge, the ultimate wisdom and we should expect the wise all around the world to share this knowledge, wherever it came from. Certainly we should not be surprised to find astrology is the basis of all our ancient religions, including Christianity, Hinduism, Buddhism and the Tao. It would be strange if it were not so. It would be strange if the Christian faith recognised different deities ruling our lives from Heaven to the Spirits of the planets which rule our lives from the Heavens. We should not be surprised to find the characters of the Christian Trinity so closely match the characters of the major planets. And it would be strange if all religions didn’t secretly recognise the same One God when there is only one Sun which has created all there is on our planet, all the life certainly and which continues to sustain this life in every way. Certainly it’s high time all religions understood they all really recognise the same God and stopped fighting one another and enjoyed our differences instead ! It’s also high time modern science recognised spirituality, spiritual phenomena and the spiritual sciences are not foolish superstitions : they are founded on the oldest and wisest science of all. Without recognising this spiritual dimension, science loses its humanity and that, as we can see, is NOT the direction we want to go in.